Accelerate Product development, increase reuse and productivity! Montreal, April 27, 2016. 3DSemantix proudly announce the release of 3DPartFinder™ Certified Suite for the 2017 Autodesk Inventor and Autodesk Vault users. Finding 3D models and their related information to accelerate product development, increase productivity and help reuse is possible for all users of the Inventor and Vault community! Designers creating 3D models in Inventor to design new products are facing a problem when searching for similar parts using alphanumeric-based search systems. This method is so unproductive that today, designers prefer to create a new part instead of using one that is already available or even in inventory! The designer is facing a semantic gap; he search for SHAPE but has to provide ALPHANUMERIC characters to the search engine, hoping the model name will contain some and bring a few results. 3DSemantix has filled the gap with 3DPartFinder, a revolutionary search engine using part geometry and shape as the key for search. 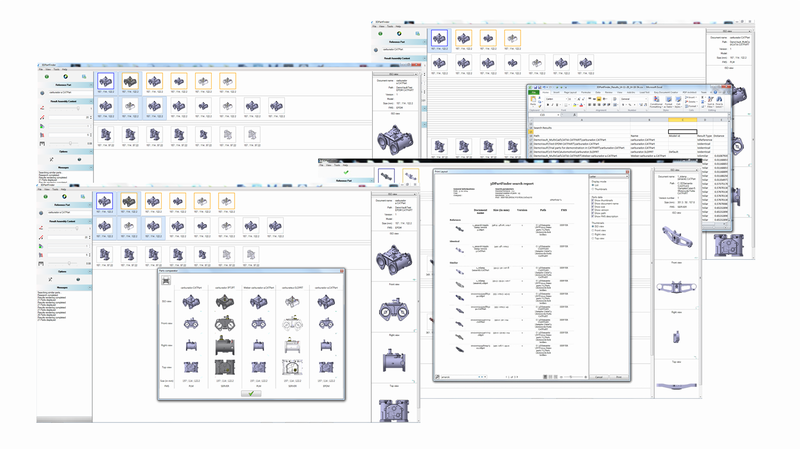 Figure 1: 3DPartFinder for Autodesk Inventor finds all your similar parts based on their SHAPES. You can launch a search using a known CAD model (BLUE) or from a 3D rough sketched of the target part done in Inventor connected to Autodesk Vault or not. 3DPartFinder will find all similar parts (GREY), duplicates (ORANGE) as well as mirror parts (GREEN) and even previous versions stored in the Vault if indexed. 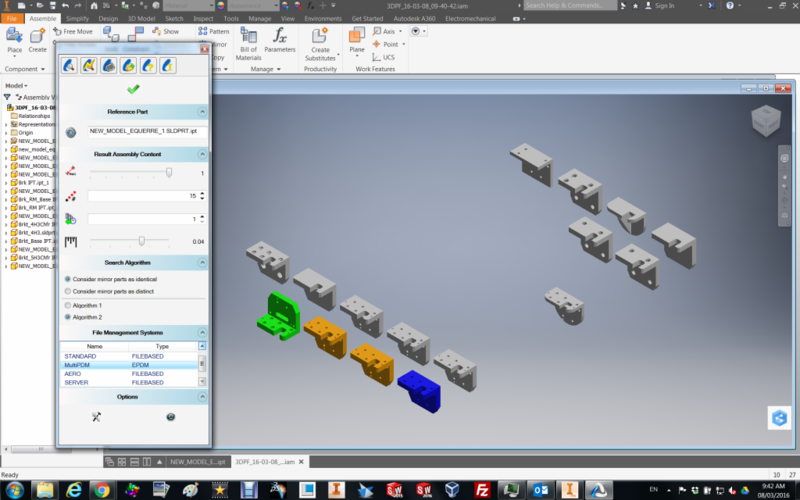 Results are displayed in an Inventor assembly for immediate decisions and exploitation in the CAD (see also other solutions)! Find and reuse: The advanced geometry-based search capability of 3DPartFinder™ solutions accurately identifies similar parts, duplicates and/or mirrors and enables part reuse and associated information for reutilization. It also promotes knowledge re-use in core engineering while minimizing time and expenses associated with designing or purchasing duplicate parts. Reduce your costs: Less new parts created or designed from scratch. Save Engineering time (design & reuse), cost in tooling, prototype, CNC programs, tests, certifications and more. Innovate and Deliver you project faster: Less new parts created or designed from scratch will lead to faster project delivery but not only that, it will allow you to spend more time where it counts: INNOVATION! 3DSemantix has created a shape-based search engine and solutions: 3DPartFinder that finds all your similar parts based on their SHAPES. Directly in your CAD system, you can launch a search using a known CAD model or with a rough 3D model of the target part and results will be displayed in your CAD. It could connect Autodesk Vault or other PDM or PLM, and could display previous version of a part if requested. 3DPartFinder will find all similar parts, duplicates or mirrors directly in Inventor CAD system linked to Vault or not, or in a dedicated application for Non-CAD Users. It could analyze your parts database to provide all duplicates or quasi-duplicates in order to reduce costs and help standardization. Our solutions are Certified Inventor 2017, 2016, 2015 and 2014, Vault 2017, 2016, and compatible Vault 2015, 2014, Inventor 2013 and Vault 2013!